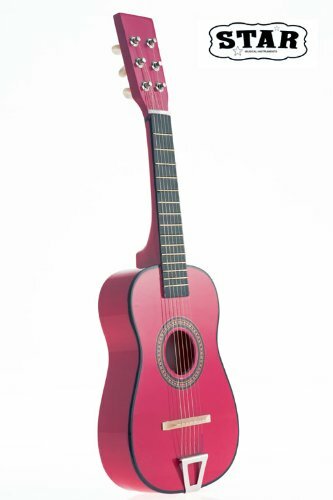 This beautiful Acoustic Guitar is the ideal toy for toddlers and children! It is a steel string Acoustic Guitar, which is perfect for “pretend” play. This Guitar is 23 inches in length and features a hardwood body, lindenwood binding, and 15 frets. Please note that this is a TOY Guitar and may NOT tune properly. To tune the Guitar, we recommend tightening the screws on the tuning knobs. These screws are located on the tuning knobs on the back of the Guitar tuning machine. This guitar is everything your child needs to get started playing. This 23 inches Acoustic Guitar set makes a great gift for kids and is a great value for the money! This Guitar comes packaged in the original manufacturer”s box. The box has a full color photo of a Guitar on the front. Please keep this in mind when purchasing this Guitar as a gift. The Guitar Includes an E extra String and guitar Pick.